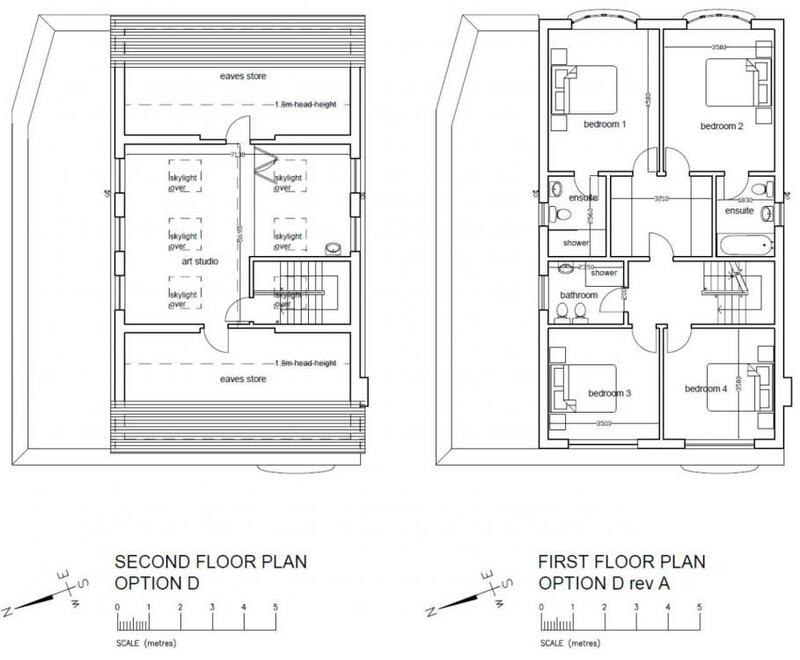 Background - we have a narrow plot in a residential area within M25, with an existing bungalow (to be demolished). Neighbours' properties are very close, so party wall agrt is coming up, and a basement would be too dangerous. Not much room to move around, really, so we are building up. Generally we are quite pleased with the plans, but after looking at these for the past 6 weeks we need an extra pair(s) of eyes to see what we can't see. One of tight areas is access from street to garden (via garage only, so garage doors on both ends). Any feedback would be gratefully received. Furniture placement is very random at the moment. Are the 4 beds a personal requirement or have they been incorporated for future resale market value? Will the downstairs study and top floor studio be used concurrently by different family members? It would be helpful if you provided a total floor space. Four beds are a personal requirement since we all have separate bedrooms (sensitive sleepers, sleep problems, etc), plus guests stay overnight frequently. The study downstairs is DH’s permament place of residence all day long since he is working from home, and being in IT industry somehow populates the study with miles of cables and tons of hardware, so again a must. top floor studio is used by all of us but mainly is my hobby space (painting, modelling and costume design take up alot of permament space, have to avoid packing/unpacking, etc. GF is c.100 sq m, FF c.80 sm m, SF c.37 sq m (excl eaves). Making space for an artist's studio specializes the house though I guess inside the M25 has more creative people per sq mile than elsewhere in the UK. I can foresee a future purchaser wanting more communal space as a young family and considering knocking Bed 3 & 4 together to create an extra living room and then turning the studio into a large parent's master bedroom. I was going to suggest plumbing for a future top floor ensuite but with bathroom plumbing below the potential is there. The inner landing is odd, something to do with designing around light sleepers or attenuating road noise at the front? It creates loads of cupboard space. All in all the design meets your requirements very well and I cannot see areas to improve. As a sometime work at home IT person I would like the downstairs office with immediate access to kitchen and outside garden when the weather improves. Would the budget stretch to building over the carport and garage to give the floors above an increase in floor space. @epsilonGreedy you are absolutely right about cupboard space - we are basically creating a shared walk-through wardrobe space, with floor to ceiling wardrobes along both walls, to free up bedrooms as much as possible. We currently live in this bungalow without a single utility space (unbelievable, i know), and we have lots of stuff so storage space is essential. Totally agree with you re plumbing on SF, we do extend basic water supply up there (art needs access to water, hence a sink in SF), so potentially can be converted to a bathroom with reasonable ease. Again, true re proximity of study to kitchen, as DH is the Chef of the house, but garden is not essential to him (but is to me), hence study is downstairs rather than upstairs. @Declan52 potentially why not, however currently we only budget for living space within the main perimeter and not above garage. However plan to insulate floor in garage as in residential area. An elevation or two would be very helpful, too. To me it looks like a very good, effective plan for London ... up rather than out; the opposite of a traditional city gent ... and fully exploits the plot. The orientation is good, as you will not have direct sun at midday on any side, and you obviously know about light in studios. 1 I think you perhaps want something to allow use of space outside the kitchen in light rain, evenings or winter for eg meals, parties or gardening activities. Perhaps a pergola? 2 I think provision for a shower in the downstairs cloakroom is important. Muddy dogs, disabled guests, future old age etc. 3 I a not sure that those stairs will take a stairlift, so you will perhaps need to identify a possible location for a future lift .. which is a better idea than a stairlift anyway, and is a good thing to be in a 3 story house, especially in London, and especially if you have oodles of kit and stock to take up to the top floor for your craft activities. It is a massive advantage to plan for that from the start. 4 The garage and carport look pretty good in design, but do consider maintenance of the wall and windows above - provision for a walkway and ladder stand up there? 5 I concur with Agent Epsilon that you could benefit from facilitating future rearrangement to a more usual Master Suite plus Hoi Polloi plan; the current one feels a little too egalitarian for what the market may want in future. 6 I am not really convinced by the inner landing, especially as it is large. if you turned the two ensuites by 90 degrees you could have larger bedrooms and keep the same ensuites, or shuffle the staircase along and make 3 beds 3 and 4 larger. IT might be an idea to use the extra space to give a big joint walk in wardrobe that could be repurposed as a dressing room in future to make one of bed 1 or bed 2 into a master suite in future. You still get a slightly smaller inner landing. Another option might be to make bed 3 and 4 divided by a well insulated stud wall that could be removed later, which would give a master suite with his and hers ensuites. Very luxurious. 7 I think the house would significantly benefit from fixing a way to get more light into the central spaces on the Gand and 1st. lots of ways to do this, but this reply is long enough already. 8 Do you actually want a cloakroom in the studio now, so you do not have to go downstairs when you are in full creative flow? 9 I think the his’n’hers loos in the family bathroom are innovative and completely darling . I’ve been imagining the tortured faces that Geoffrey Palmer would have been pulling having a conversation with Wendy Craig trapped in such a bathroom in Butterflies, presented in a letterboxed talking heads format, but even Carla Lane did not think of that one; it would have been a slightly different sitcom. Finger trouble in the symbol box in Autocad? Rejig that, perhaps in conjunction with a minor re-layout of the 1st floor, and you could have a 4 piece suite with bath and a large shower in the family bathroom. I do like it all. @Ferdinand thank you so much for taking the time to review in such detail, hugely helpful! 1 I think you perhaps want something to allow use of space outside the kitchen in light rain, evenings or winter for eg meals, parties or gardening activities. Perhaps a pergola? - Totally agree, a pergola will be included. I have not yet started proper landscaping plans for the garden, this will be me, not our Architect, so am warming up before announcing plans and budget to DH 🙈 Garden is c.125 m sq, almost a square shape. Not fully included in the plans I posted. 2 I think provision for a shower in the downstairs cloakroom is important. Muddy dogs, disabled guests, future old age etc.- No dogs in this household, this is entirely cat's terrain, but definitely a thing to consider (a shower, not a dog). 3 I a not sure that those stairs will take a stairlift, so you will perhaps need to identify a possible location for a future lift .. which is a better idea than a stairlift anyway, and is a good thing to be in a 3 story house, especially in London, and especially if you have oodles of kit and stock to take up to the top floor for your craft activities. It is a massive advantage to plan for that from the start. - We quite like the idea of a vertical tubular lift (going up from dining area to one of the bedrooms), it costs c.£11k, and is much simpler than a stairlift. Stiltz or similar. 4 The garage and carport look pretty good in design, but do consider maintenance of the wall and windows above - provision for a walkway and ladder stand up there? - Great point made, thank you very much. Will discuss and consider. 6 I am not really convinced by the inner landing, especially as it is large. if you turned the two ensuites by 90 degrees you could have larger bedrooms and keep the same ensuites, or shuffle the staircase along and make 3 beds 3 and 4 larger. IT might be an idea to use the extra space to give a big joint walk in wardrobe that could be repurposed as a dressing room in future to make one of bed 1 or bed 2 into a master suite in future. You still get a slightly smaller inner landing. - Good ideas, will consider. For now, see above re wardrobe space requirement. 7 I think the house would significantly benefit from fixing a way to get more light into the central spaces on the Gand and 1st. lots of ways to do this, but this reply is long enough already. - Agree. Current plan does not include a landing window mid-stairs between GF / FF, it's last-week's addition, not drawn up yet. @Declan52 potentially why not, however currently we only budget for living space within the main perimeand not above garage. However plan to insulate floor in garage as in residential area. I would put the founds in for that part on the assumption that you plan to build on up in the future. Same goes with the walls, insulate them as you will do the rest of the house. So in the future it will be dead easy to strip back the roof and build up. You might never do it but all least the option will always be there. You never no what the future will hold. To add one more, I would think about a full size glass panel next to the door in the studio, to get light down to FF. As you are arty Types, what about stained glass or even etched glass (my favourite). I would concur with most of the suggestions already made. I am not a fan of the shared wardrobe space, it could be very awkward as family circumstances change or for future buyers. I would be tempted to turn around the en suites as suggested and put the wardrobes between them and the bedrooms. I might go further and make bedroom 1 next to the stairs and then make bedroom 2 slightly smaller to allow for a larger bathroom and a wardrobe in bedroom 3. This assumes that you don't go the whole hog and put another bedroom on the second floor. Unless you have a bidet today and use it I would not bother. You can get combined toilet bidets if you really need one. One of those fancy Japanese toilets would almost cover the cost of an extra toilet on the third floor. I would be tempted to make the utility room smaller and the dining area plus maybe the WC bigger. I don't find you really spend much time in the utility room, you just go in there, put the washing on and leave. Making the utility room smaller and turning around the en suites might free up space to move the stair back 2-300mm. The main lounge is quite tight at 3.5m wide. I assume there would be a cupboard under the stairs not marked. I would turn the kitchen door around to hit the closed end of the units and not the doors at the other side. Ideally I would try to have a more open area in front of the door, but this may not be possible with space constraints. Considering the value of a square foot of floor area in the M25, I would consider making the eaves storage area smaller on the second floor and the floorspace larger. You could easily take it to the 1.8m line. Then with a larger area it might be more attractive to break it up and add a bathroom which I really would try and do now. Definitely have a window on the ground to first and first to second half landings, it will make a massive difference to the hall. Fit a hand shower to the loo and leave out the bidet, but add the bath I mentioned earlier. The killer need for te bidet might be if someone needs to do daily footwashes and examinations, for the convenience eg if you have a diabetic in the house. Fit a handshower anyway .. half the world use them. Great ideas, thank you everyone! What a fresh look does!.. Re whether or not we are having a SF space, it depends on what the Planning authorities say, and we expect to hear some time next week (Christmas, etc out of the way, the council should be picking up pace now). If they say no it will be a complete game changer in which case FF will get fully reshuffled. Noted re turning around ensuites, will play around with RoomSketcher and see what it looks like. With regards to moving stairs back and enlarging reception, I can see the point, however we're a bit stuck here. 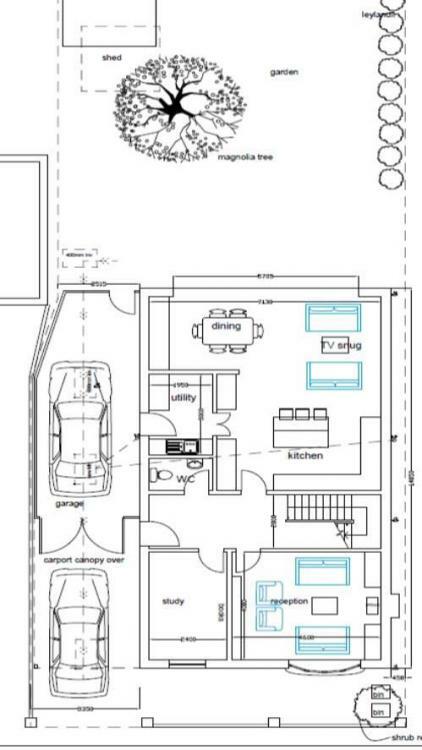 You see, the plot is bloody narrow, and on the left-hand side the neighbour's garage (note in the top left corner of plans) sort of eats into the plot, creating a diagonal change to the wall (don't us us why - historically!). 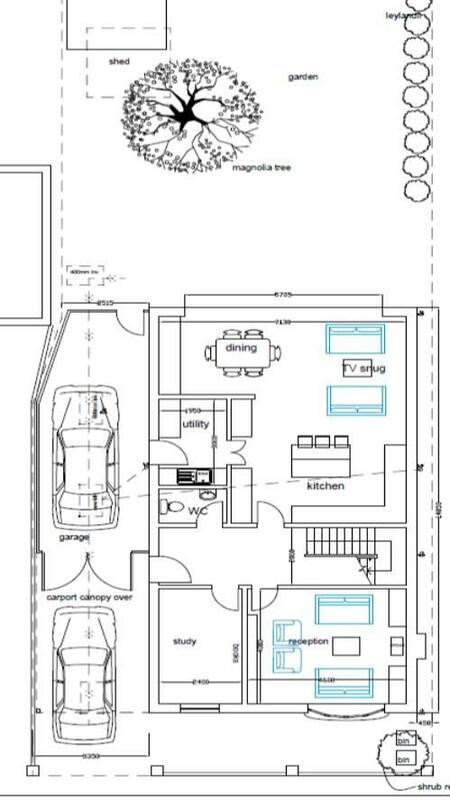 So our garage is quite conservatively planned around the largest of our two cars (an "estate" e-class), which in turn restricts severely our options to place the front door. You can notice it is not "centralised" in the hallway. Under stairs goes a built-in coats space. Generally we do need a significant amount of storage in the house, can't help it. Noted an increasing number of votes for SF bathroom, so will have to seriously consider. And yes, daylight on the stairs is definitely part of the plan now. The shared walk through wardrobe is the bit giving me concern. That is so quirky I think it would put a lot of people off. A compromise might just be cupboards either sides of the access to those bedrooms but loose the door onto the landing, going through 2 doors (one shared) to get to the bedrooms is so odd. @ProDave, in fact, I'm totally with you on the extra door - not sure why our Architect put it in there, we did instruct to remove this, as the space is supposed to be open, not enclosed. And yes, built-in wardrobes with mirrored sliding doors on both sides, so in fact it's just a wide corridor / extended landing, flanked by wardrobes. That's all. ASk them explicitly why they have a problem with obscured windows; they might not have noticed. And consider a mansard roof, or a Dutch Barn roof. AS I see it, a Mansard would actually give you more space inside, even were you to make it mansard with parapet .. like a squared off cottage loaf. You could even try a set back mansard with a balcony at the front. If they still have kittens about side looking windows on your mansard, it depends whether it is overlooking or appearance. YOu could potentially use a blank or two to keep an interesting appearance if you have to look at that facade ... like Hawksmoor on the LHS of St Mary Woolnoth. @Ferdinand thank you, that's a great idea, our architect is currently digesting the detailed feedback report and will produce something similar to what you suggest. 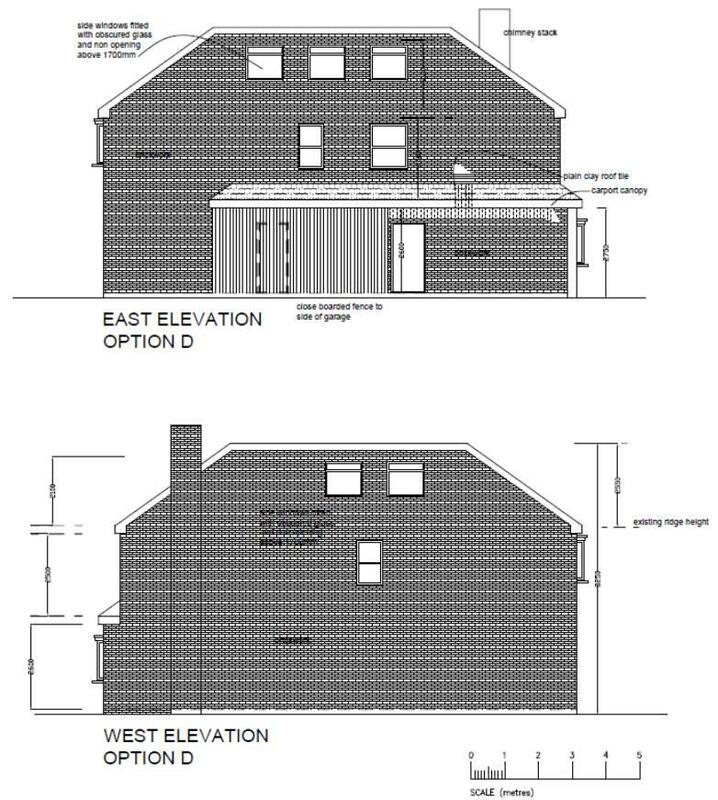 He also suggested we could be "strategic" about this and first build what the council want in terms of roof, and if needed then change it later under permitted development. YOu could actually do a roof terrace on part of the roof, perhaps with obscuring walls ... which would give you an Art Space outdoors for your studio. Very glam. Here is an example from Grand Designs for the Slip House or Ice Cube House in Brixton, also In a terrace. THe buggers found a site that ran right through between 2 streets, so got a bundled building plot. Photo of the roof terrace half way down. They used translucent glass for privacy. It reminds me of an American Sculptor I used to know when I lived in the City of London. HE lived in a Warehouse near the Regents Canal, and had a patio by his studio with a track onto the patio. He would roll the current project out every so often through the French doors to get an evaluation in natural light. IT would work with a surrounding wall, as skylight is much more powerful than side light. He was like a 6" shorter version of KRis Kristofferson, and would walk along muttering numbers as if practising for Countdown, when he was actually evaluating the passing talent out of 10. A character, and the first person I ever actually knew who charged more than 5k for his artworks.